Colleges seeking university status aren’t just looking to change their institutions – they’re aiming to change what a university can be. In the span of a week, the future of three Alberta colleges was set. On February 22, Minister of Advanced Education Marlin Schmidt announced that Grande Prairie Regional College (GPRC) had been approved for degree-granting status, with a view to becoming a university. On March 1, Premier Rachel Notley appeared at an event to announce that Red Deer College (RDC) also had been approved to grant its own degrees. That same day, the education minister again went before the cameras to confirm that the Alberta College of Art + Design (ACAD) had achieved university status. “What I’ve learned in my 25 years in postsecondary … is every decision is a political decision,” said RDC president Joel Ward on the close timing of the three announcements. The college-to-university transition is a recurring phenomenon in Canada. Two other Alberta colleges made a similar transition less than a decade ago, while British Columbia saw five postsecondary institutions (three university-colleges and two colleges) become universities back in 2008. Yukon College is also slated to officially become a university within a couple of years, and Sheridan College in Ontario has stated its interest in becoming a university by 2020. Although the recent Alberta announcements might be tied to the priorities of an NDP government nearing the end of its mandate, as Mr. Ward suggests, it’s also clear that these colleges have put in the work to get to this point. 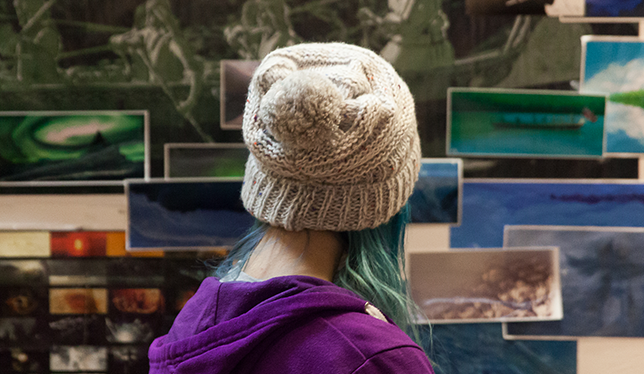 A student looks at an art exhibit at the Alberta College of Art + Design, which was recently granted university status. Photo by A. Nichols. RDC, located in the City of Red Deer halfway between Calgary and Edmonton, has been lobbying the provincial government more than 30 years for this change. It made its last unsuccessful bid in 2007. “We have been disappointed before, but this time it wasn’t an ask from the institution, it was an ask of the community,” Mr. Ward said. The latest request to begin the transition to a degree granting institution came with letters of support from the campus community as well as businesses, Indigenous communities, municipal governments and school divisions from across central Alberta. “I realized that if it’s an institution ask, it’s easy to say no. If it’s the community asking, it’s a lot harder,” he said. To gain public backing, Mr. Ward said RDC presented the transition as a social justice issue – a local university would improve access to education in the region and make it more affordable. “The community was quite worried about the brain drain. Students were leaving the community and 90 percent wouldn’t come back,” he said. Mr. Ward estimates it will take RDC three to five years to become a full-fledged “comprehensive regional teaching university” offering degree programs as well as trades and diploma programs that “ladder into degrees.” He added that GPRC’s transition to a university will likely take about eight years. ACAD’s transition team is now “engaging the community and external stakeholders” in rebranding and renaming the institution, with the goal of presenting the province with its proposed changes to the Post-secondary Learning Act (PDF) in September. Karen Barnes, president of Yukon College, has been keeping an eye on these changes in the south out of self-interest. In 2015, the Yukon government approved her institution’s request to grant degrees and change its name after more than 40 years of lobbying all levels of government. The plan is to fully transition to Yukon University by 2020. Like RDC, Yukon College has gotten to this point thanks to the support of its local stakeholders. Now Dr. Barnes has her sights on boosting the institution’s profile nationally. “This is going to be the first northern university in Canada. … We have the potential to address issues significant to all of Canada, like climate change and self-governance. We should be messaging this and making this a story that we can tell,” she said. Dr. Barnes brought that message to Ottawa as part of the Yukon government’s annual Yukon Days showcase in February. And, last year, the college made national news when it entered into a five-year partnership with the MasterCard and Rideau Hall foundations that will invest millions of dollars in educational pathways and academic success programs for Indigenous students. Of all the work in progress at the northern college, however – building a branding strategy, internal policies, funding formulas, research capacity, campus infrastructure and capital campaigns, and launching its first BA program this fall – Dr. Barnes is most concerned about academic governance. The team at Yukon College wants a new kind of system, one that suits a “hybrid university” with a range of trades, vocational, degree, postgraduate and applied research programs, she said. The Alberta government designated Mount Royal and MacEwan as universities in 2009. Often the next step is for these institutions to apply for membership to Universities Canada, a non-governmental organization that currently represents 96 public and private not-for-profit Canadian universities. (Universities Canada is the publisher of University Affairs.) Mount Royal became a member of Universities Canada in 2009 and MacEwan in 2012. The organization is not a national accreditation body, although membership in Universities Canada requires universities to meet certain criteria, including a set of institutional quality assurance principles, degree-level programming and an appropriate governance model. Each of the presidents interviewed confirmed their intentions to apply for membership to the organization. BC experienced this in 2008 when 5 university colleges and colleges were transformed to universities with no additional funding. Some still struggle with their true identity and their focus. Others wrestle with rank and tenure issues as well as governance, heavy teaching loads, and raised service demands with no shift in pay from the college model days. From a policy perspective, we need to ask what problems these new universities are solving and what new ones they create. For example, decreased emphasis on access through higher tuition and standards can disenfrachise those where post secondary education is already a difificult possibility. Does this serve the goal of liberating education for all Canadians or is it more likely to fuel greater social inequity?